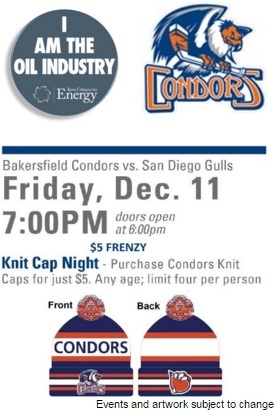 To show our appreciation for all the support our local oil and gas industry has received recently, we’re partnering with the Bakersfield Condors for “I Am the Oil Industry” group night on Dec. 11! We’re celebrating Kern County’s rich heritage and more than 100 years of petroleum’s contribution to our energy independence and exceptional quality of life. Our goal is to pack Rabobank Arena with support for our local industry and we need YOUR help! Invite your family, friends and co-workers. We cannot think of a better way to spend a Friday night than taking in a Condors game while supporting our local petroleum industry. Let’s make this an evening to remember! I AM THE OIL INDUSTRY GROUP NIGHT!